In 1979 four Toronto actors, "resting" and bored between auditions and jobs, decided to create a band. Problem: Paul Cooper, Mark Connors, Claude Morrison and Denis Simpson weren't instrumentalists, but, dammit, they sure could sing. The four were singing their hearts out in the back room of a Toronto deli, and soon there were little after-hours gigs and some benefit performances. With a reputation building in Queen Street "art" circles, The Nylons - named in the style of black vocal groups like The Orlons and The Chiffons - were ready for prime time. In April 1979 the group had its first "professional" engagement in an upstairs (and unlicensed) club across the street from the Art Gallery of Ontario in Toronto. The second Nylons Christmas CD, comprising ten tracks, half written by the group. Those familiar with the Nylons' sound know that they have used rhythm tracks on past recordings. Well, the percussion on 'A Wish For You' is vocal, with Wes Carroll of the House Jacks guesting on two songs. The Nylons are one of the original contemporary a cappella groups, who have continued to perform and tour, write and record for over twenty years. The group has only gotten better with time, displaying heart and integrity that inspire audiences from their native Canada, and throughout the world. Produced by Ian Prince. In 1993 Attic Records and Windham Hill Records put out their first collection, entitled Best Of..., which, like the later compilation Perfect Fit is a fine survey of the four Nylons whom most consider the originals, Marc Connors, Paul Cooper, Arnold Robinson and Claude Morrison. Many of the signature tunes are found on both releases but uniquely on Best Of... are "That Kind Of Man," "Up The Ladder To The Roof," "Please," "Stepping Stone," "Bop Till You Drop," "Combat Zone," "Wildfire" and "The Stars Are Ours." Classic Nylons! Here we have the archetypical fabulous vocal harmony accompanied by rhythm tracks. As Happy Together was released in 1987 it can be said to be in the prime of the early Nylons. Though the best known tunes from this recording are "Happy Together" and "Kiss Him Goodbye," this reviewer finds "It's What They Call Magic," "This Island Earth" and the soaring falsetto on "Grown Man Cry" particularly memorable though perhaps less AM Radio worthy. Additional notable arrangements are "Chain Gang" and "A Touch Of Your Hand." The Nylons are one of the original contemporary a cappella groups. Their many years of experience have produced a vast playbook of stylistic variations, along with consistently excellent musicianship. This subtly-accompanied 1994 release reflects this abundance. The arrangements are generally simple, and the songlist contains the Christmas standards - "Silent Night," "The Christmas Song," "I'll Be Home For Christmas" etc. - plus a Nylons original, "What Does Christmas Mean To Me." The emphasis is on the quality of the voices, as the group members are gifted singers individually as well as collectively, and are able to convey the sentiment of this special time of year with heartfelt feeling. Founding members Arnold Robinson and Claude Morrison are joined by Gavin Hope and Garth Mosbaugh. Scotti Brothers released this compilation of tunes in 1997. The Nylons had recorded them while on that label and all have been released on other cds. On it are arrangements which vary from live performance sung unaccompanied by even their patented percussion track ("One Fine Day," "Up On The Roof" and "Kiss Him Goodbye") to the instrumentally enhanced tracks found on the cd Because ("The Time Of The Season" and "Will You Still Love Me Tomorrow?"). If you aren't a collector this release gives you a fine survey of their mid-careeer period. The Nylons have long been one of our favorite groups, most recently wowing the audience at the West Coast Summit. What we love about them is that they don't just cover a song, they "vocally sculpture" it, giving it a new dimension from the original. "Illustrious" is a "best of" collection from The Nylons' many CDs and huge number of live performances, and it's a treat! 13 songs: the live cuts "Duke of Earl" and "Chain Gang," "Love Potion #9/Spooky," the quintessential version of"The Lion Sleeps Tonight," "Up On The Roof," "Silhouettes," "Town Without Pity," "Remember," "Kiss Him Goodbye"...the hits just keep on coming. The Nylons simply sing and perform rings around most Doo-Wop groups, and never was this fact so evident as it is on "Illustrious." Great stuff! Attic Records has been working with Windham Hill Records to rerelease the Nylons' "Attic years". Perfect Fit is a collection of favorites from the previous releases, The Nylons, One Size Fits All, Seamless, Happy Together, and Rockapella. This release is a grand survey of the early Nylons giving us, "The Lion Sleeps Tonight," "Happy Together," "Kiss Him Goodbye," "Love Potion #9/Spooky," "Silhouettes," "Chain Gang," "Poison Ivy," "Drift Away," "All I Have To Do Is Dream," "Up On The Roof," "This Boy" and three more. The veteran male quartet the Nylons, who wowed the West Coast Summit audience not long ago, show us once again the innovative, driving arrangements, tight harmonies, soaring leads, rhythm and soul that has made them a favorite of ours for years! There's non-vocal percussion on just about every cut, but the emphasis remains on the amazing vocals. The song selection is typically well-chosen and fearless: Sting's "Every Little Thing She Does Is Magic," Garth Mosbaugh's "Play" and "Wrong and Right," Kenny Loggins' "This Is It," the lovely Whitney Houston hit, "Feel Like Making Love," "Loving You," "Good Enough to Love," James Taylor's "Only One," "Could've Been You," "Hey There," Paul Simon's "Late in the Evening" and "One More Lonely Night." Every cut is excellent, and some, like "Late in the Evening," the guys just flat out nail! The Nylons are one of the best in the business, and "Play On" is their strongest, most soulful CD to date! The oft-imitated "Lion Sleeps Tonight" leads off this 1984 recording. Other memorable tunes include "This Boy," "Perpetual Emotion,"
We caught the Nylons' act of classic soul, Vocal Jazz and pop hits at a West Coast A Cappella Summit some years ago, and Tyrone, Gavin, Claude and Garth are as smooth as they come! There are 12 covers here, all accompanied by an unidentified jazz combo: "They Just Can't Stop It" ("Games People Play"), ""What A Fool Believes," the Jazz standards "Like Young" and "Orange Colored Sky," "Seven Day Fool," "All in Love is Fair," "Crybaby," "Spider-Man," "Teach Me Tonight" "Night Train," "Suddenly I See/Acqua De Beber" medley and "Gone Too Soon." "Skintight" has sweet, soaring leads, jazzy scats, rich background vocals, great arrangements-this is great stuff from veteran, quintessential entertainers the Nylons! A twenty five year retrospective featuring a collection of many of their hits plus unreleased tracks, rehearsal tapes and two new bonus tracks "Secret Part of Me" and "Eli's Coming". After fifteen years with Scotti Brothers and Attic Records, the Nylons continued their recording career on Primarily A Cappella with a collection of tunes superbly produced by Ian Prince who also wrote six of the songs, three in collaboration with Garth Mosbaugh. The heavily R&B album even treats the covers of "Ruby Baby," "Let It Be," "Ain't No Sunshine" and Hall and Oates' "I Can't Go For That" to an R&B make over. Don't get caught by by the orchestration which sounds synthesized until a great fiddle break on "I Can't Go For That." Surprise! Canada's The Nylons cover the classic Bill Withers song and make it unmistakeably their own, showing the confidence and assurance that has brought them success since their formation in 1979. The arrangement, built upon an mesmerizing repeating bass figure, sets the pulse for one of the most satisfying cuts from their latest CD, "Fabric of Life." This is the one that began the most enduring career of any modern vocal group. The self titled album went gold in Canada in two months with huge radio hits of "The Lion Sleeps Tonight," and "Up On The Roof" which are among their signature tunes to this day. "Duke Of Earl" was recorded live in Vancouver before a wildly cheering audience, the only live track. For the "purist" a cappella fan, "A Million Ways," "Somethin' Bout Cha," "Duke Of Earl," "Rock & Roll Lullaby" and "Up On The Roof" are accompanied by only finger snaps or hand claps. Nylons : Live In Tokyo and more..
Of all the contemporary a cappella groups The Nylons have always put on one of the best shows, in great part because of their background in live theater. So this DVD of a historic concert shot in Japan in 1986 is a real treat and a must for all Nylons fans. The high production values shows the guys at their high-energy best and features Marc Connors, Claude Morrison, Paul Cooper and Arnold Robinson. As well as the thirteen song concert footage there are six bonus music videos that the group has shot over the years which helps makes this a most enjoyable watch! First performed by The Persuasions and popularized by The Nylons, this tune has been sung by countless contemporary a cappella groups. 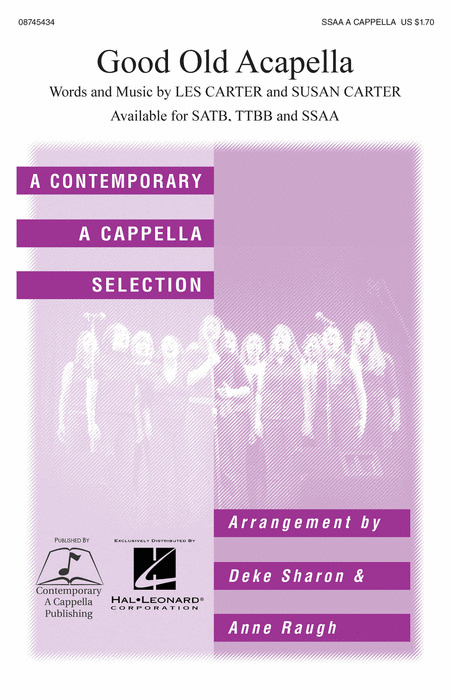 Originally from the collection Contemporary A Cappella Volume 1, now for treble voices too! 1950's-'60s chart hits the '80s with a hot a cappella rendition of The Nylons! Irresistible energy and drive make this an audience favorite!